James Phillips Webber was born in Wales, his mother was born in New York, of Dutch lineage; his father was born in Ireland. James' parents married in London and lived in Wales and nearby Shropshire, England. James' mother, Charlotte Phillips, was born at Philipse Manor Hall in Yonkers, New York. Her parents were wealthy New York landowners who remained loyal to England during the American Revolution and consequently were forced to flee to England with their children in 1784. James' father, Edward Webber, joined the British Army as an ensign and rose to the rank of lieutenant-general (Tocal is seeking information on Edward's ancestry, see report). James Webber's maternal grandfather is interred in Chester Cathedral and James' parents are buried in the Cathedral's grounds. James Webber was born at Overton in Flintshire, Wales in 1797, the eldest of three brothers. In 1821 he set sail for New South Wales, arriving in January 1822. Soon after his arrival he was granted land on the Paterson River and in about 1831 he named this estate 'Tocal'. He was Tocal's first European settler. 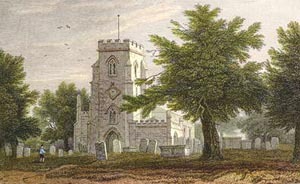 Above right: Overton Church where James Phillips Webber was christened on 17 July 1797 (steel engraved print, 1832). Ironically the American Revolution which caused great distress to his grandparents was indirectly a key part of James Webber's success in New South Wales. Transportation of convicts to NSW began when they could no longer be sent to America after it gained its independence. James Webber built the wealth of his Tocal estate using convict labour. Above: a view of Philipse Manor Hall, the home of James Webber's grandfather, on the Hudson River at Yonkers, New York (drawn in 1784). Below: a map of England and Wales, with inset showing Overton, the village where James Webber was born.